There are two upcoming opportunities to participate and give, please help Gabby’s Sanctuary ARK with these two events for 2018. 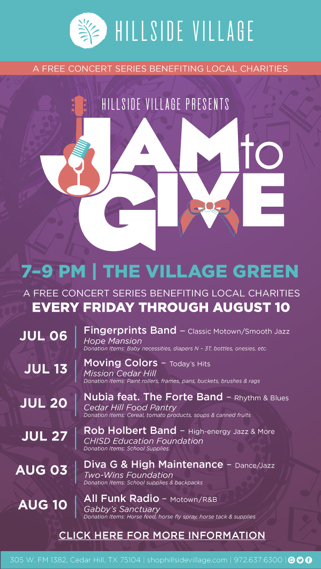 The Jam to Give concert series at Hillside Village (305 W. FM 1382, Cedar Hill, TX 75104) a free concert series benefitting local charities every Friday through August 10th. Gabby’s Sanctuary ARK will be featured on August 10th between 7-9 at the Village Green. Gabby’s Sanctuary will have a drawing for a wonderful prize. Blankets and outdoor chairs are allowed for comfortable seating. Coolers with outside food/beverage are not permitted on the Village Green. You are welcome to bring to-go orders from Hillside Village restaurants and eateries. Alcohol is not permitted. We suggest you arrive 15 minutes prior to the performance. Schedule is subject to change. In the event of inclement weather, the concert will be cancelled. Check our Facebook page for updates the day of the concert. The 2nd opportunity is the Communities Foundation 10th year annual North Texas Giving Day (NTGD). This is an 18-hour online giving event. For the 3rd year in a row, Gabby’s Sanctuary ARK will once again participate. Help us continue to help animals and others by donating to Gabby’s Sanctuary ARK. On September 20th between 6am and midnight click on Gabby’s Sanctuary ARK to donate. If you don’t want to wait until September 20th you can schedule your donation. You can do so starting September 10th thru September 20th. Your donation will be processed the morning of September 20th. Please visit our NTGD page to donate to Gabby’s Sanctuary ARK. Please note that our physical address has changed and we are located at: 2415 Sunny Meadow Rd. Lancaster, Texas. We need to update that on our North Texas Giving Day page. We are always looking for and welcoming volunteers at our facility. Our barn and arena are located at 2415 Sunny Meadow Rd. in Lancaster, Texas. We ask that you look at our Volunteer page (because there are a couple of things you will need to know) and then contact us so that we can get you scheduled. Our hope is to continue to provide a facility for horses and humans to heal and for you to be a part of that!